Raising Samuels Life: What is a Funk and How Can I Avoid It? "cowering fear; state of great fright or terror," or "a dejected mood." Sometimes, these funks can last only a few mere hours, or just for a day. Other torrential times, they can last for weeks, months or even years. What causes these funks and how can we recognize them so that we can avoid them? Funks are not bad days. Everyone is entitled to a bad day. Funks are getting ourselves so deeply and darkly depressed that we ourselves don't even notice at first. We start to blame other people for our moods. We then to start to pick at every single aspect of our life that we are not satisfied with. We feel justified for our attitude. This can be extremely dangerous and not only for ourselves, but for the very people we care about. Several years ago, before I was married or had children, I was in an emotionally abusive relationship with a man. I started to lose weight because I didn't feel I was thin enough. I worked with this person, and I wanted to be the best and prettiest person in the office we all worked in. Sounds ridiculous now, but as a young twenties something, it was very real in my mind. I began to lose so much weight, that my clothes literally were falling off of me. I had to go buy all new clothes because everything I owned did not fit anymore. To make matters worse, this person would belittle me so much that food just didn't even taste good anymore. Life wasn't feeling good anymore. It got to the point to where I was out to eat with my Dad, and he voiced concern for me. I had gone from a healthy size 12 to a size 4 in a year's time. For my body size, I looked anorexic. I was in a funk, and someone had to snap me out of it. My brother, my Dad, and my best friend (who later becomes my husband!) collaborated and the three of them saved my life. I moved out of state and in with my best friend. He and his family then helped me become me again. It would take some time, but I was eventually returned to my normal, healthy self. I married my best friend and we were very soon pregnant with our oldest child. I rededicated my life to Christ and was baptized after my son was born. I was so grateful all these people who cared about me, came together to restore me and ultimately was saved by the grace of God. Not only did these people who love me not give up on, but God did not give up on me. You may ask, why I am going into all of this? I've had someone very close to me be in a funk lately. To respect their privacy, I am not going into details but this person received a rude awakening to the funk they were dealing with. This person had the best of intentions in pursuing a great goal, but unfortunately put everything on the back burner. The truth is, a funk can happen to any of us. When this happens to someone we love, it is not best to attack this person. They need nurturing love and support, and to be told everything is going to be ok and that you have their back. They DO NOT need to be told all the ways they messed up, or what they had at stake to lose. Upon waking up from this funk, that person knows all too well what they could have lost. Pray - God hears our prayers and knows our hearts, even when there are no words. Be in the Word - I can't tell you how off my day can be if I am not in my Bible. Even if it is 5 minutes in the morning with a cup of coffee, I need to be held accountable for my actions and beliefs. God always sends the right message or piece of scripture I need to hear that day. Stay away from people who go out of their way to take away joy, peace, or happiness - This person may be a fun character and awesome to be around and just joke around with, but this person is a thief. They are there to distract you from leading a good, God filled life. Your actions and life unfortunately don't rub off on this person, and it is usually the other way around. Old habits and behaviors creep back in and we may hurt people we love before we even know what happens. Be joyful - The news lately has been depressing to the point where I don't watch it anymore. Do things that make you happy: write, read, run, blog, swim, dance, yoga, watch a movie with your kids and slow down, have a date night with your husband, etc. Look at the positives: God has given us all blessings. Look at your children's faces. Look at your spouse. Look at your best friend. Look at your mother. Look at your father. Look at your siblings. Look at your nieces, nephews or grandchildren. Go have a nice day with them! Don't get caught up in material possessions: We come in this world naked, and we are going to leave it with nothing as well. Don't look to see what your neighbors or friends have that you don't. Be grateful for what you do have. Get outside and get some fresh air - Sometimes all you need is to get out and get some sunshine. Go for a walk or to the park with your kids. Do you live near a pool or the beach? Sunshine does a world of good! Slow down, and dare I say...take some things off your plate for a season - I feel like technology is supposed to make our life easier, but it seems we are busier than ever. Busier to the point where we have to have every single second of our days and weeks planned out with sports, tutoring, dance, piano, going to the gym, school, work, family events, church events, friends events, etc. Take a breather and look at your schedule. Could you do without one thing so maybe you had family time with your kids or a date night with your spouse? If you are going through a tough time, I encourage you to reach out to someone, even if you have hurt them. Chances are, that person loves you so much and they want to help restore you to your natural self. Are there any other ideas that you can think of to avoid being in a funk? 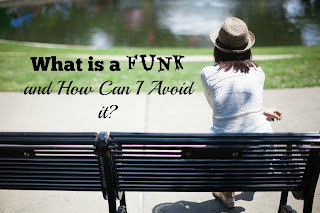 Have you, or someone close to you been in a funk? What helped you get through this time? I think these times of feeling down are often caused by the enemy as well as hormones. If we can fill our minds with truth and get out and exercise and ask God to transform our minds, we'll be on a path toward feeling "normal" again. These are such great tips for getting out of funk! I've struggled with post partum depression twice. I wish someone had given me a hand to get out of the depressions. Today, I work very hard to stay positive and follow the rest of your tips. I think it's so important to be proactive with self care. Hi, Barb! It is a hard thing to be in a funk. Not only are you hurting, but the people who care about you are hurting because they see someone they love hurting. It is very important to stay positive and just remain in God's Word to keep that darkness at bay. Praying for you and thank you so much for commenting! Great post! I love your 8 points; we all need these :) Thanks for sharing at Together on Tuesdays!! I'm grateful for how you've turned the hardship of the funk you were in way back when into lessons that can help each of us take positive steps out of a funk. I went through something similar to what you've described, Kelly, when I was in my twenties as well. It was for different reasons but the way I tried to handle my problem was very similar to what you've described. I'm so glad you had people who cared enough about you to wake you up to what you were doing to yourself. Also glad to hear that you married your best friend and later rededicated your life to the Lord. You've shared an inspiring account for us and I truly appreciate your vulnerability and insight, my new friend! Amen to that, You are correct in the definition because I went through a funk just a week ago which thank God lasted a few hours. My husband went through one and his whole day was off beat. I love this post. What a great and very practical post! I love all of the suggestions that you've shared for staying out of a funk. ~ Stay away from people who go out of their way to take away joy, peace, or happiness. ~ Don't get caught up in material possessions. I really needed this post today. I hate having this funk. Sometimes they just come! Good to always avoid them. Loved reading here on your blog today! Blessings! My Daughter just Texted last night and said she was feeling sad so she started "making a list of all the amazing things I've gotten to do with my life and I'm at two full pages so far. I've been in at least 20 different states and 4 countries. and I wanna say thank you cause I couldn't have had these experiences without you." waking up to her text brought me more joy than she will ever know. Being grateful works, writing out things works. doing so and dwelling on it daily - works. We all get into a funk, yes - even me.do what you know you need to do. it works. Thanks for this great post on an important topic along with the suggestions to help us get out of that funk! Being there for others and having others there for us is a true blessing. I just quit my PT job because of a "funk." I was overwhelmed to the point of severe anxiety, dealing with health issues - it was time to scale back. It took my husband, daughter, and sister to help me realize it was okay to do it! You've got some great advice and insight on this post! thank you for all the notes and the tips..have a wonderful weekend.